Third Coast Yoga Studio > What is Kundalini Yoga? “Kundalini” refers to the life force energy that resides within each human being. (“Prana” is the universal life force.) Kundalini Yoga as taught by Yogi Bhajan, Ph.D., consists of postures, special breathing, hand and finger positions (mudra), chanting and meditation in a specific sequence to clear the energy channels and prepare the body and mind to manifest one’s awareness of his or her life force. In the yogic tradition energy is portrayed as a coiled serpent lying dormant at the base of the spine. When we consciously raise the Kundalini it activates the chemicals in the brain and a healthful change in consciousness is experienced. The changes may be subtle or they may be spectacular. Kundalini Yoga also improves flexibility, nerve strength and glandular balance. The physical flexibility gained through the practice of Kundalini Yoga means little, however, if not accompanied by mental flexibility and a transformational attitude. The practice of Kundalini Yoga almost always leads to a heightening of you spiritual awareness. The real proof that a person has raised his or her Kundalini manifests in less stress, improved mental clarity and increased self-confidence. The technology behind Kundalini Yoga is well researched and has proven effective in the treatment of anxiety disorders and addictions. Regardless of your physical abilities or prior yoga practice, you can experience rapid results through the practice of Kundalini Yoga. Copyright Yogi Bhajan. All Rights Reserved. 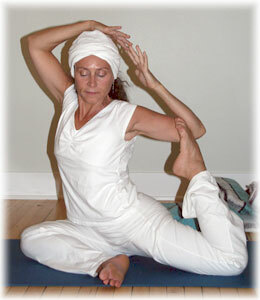 See Benefits of Kundalini Yoga and Kundalini Session Format for more info.